The Cabin-Crew-Air-Hostess-courses package is planned for interviewees and candidates who wants to become an Air hostess/flight factors in the top airlines. 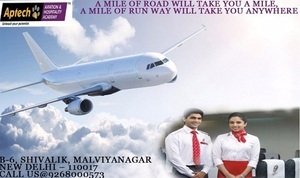 We at Aptech Malviya Nagar Institute presenting interviewees with high-quality training in the ground of aviation hospitality so as to make them an accomplished member at the end of the training classes. Many young candidates have picked the profession of cabin crew as their complete career because of the interest and experience that it provides while on the work flying to various places, meeting new people from different backgrounds and the high recompenses it delivers.